Special thanks to Google’s Be Internet Awesome program for its commitment to digital safety and for sponsoring today’s post. Have you taught your child how to be an upstander? This is an important characteristic we can help build to disempower bullying behavior. An upstander is “a witness to harassment or bullying who supports the target privately or publicly, sometimes including trying to stop and/or report the incident they witnessed” (Be Internet Awesome Curriculum). An upstander takes an ACTIVE role against bad behavior. He or she lends strength to victims either by standing up for them in some way. Most of us have talked to our kids about the right way to treat others. From an early age, we teach our kids the golden rule — to treat others as they want to be treated. Sadly, not all children (or adults, for that matter) learn this lesson. A bully’s target isn’t hurt only by the bully, but by everyone who passively witnesses the abuse. I remember as a child that my most terrifying nightmares weren’t the ones where someone was trying to hurt me, they were ones where I was in danger and no one I ran to would help me. A child MIGHT be able to understand that a few people behave badly, but how does she come to terms with EVERYONE turning their backs on her? We have to do more than teach our children to not be mean, we have to teach them to be kind. Personally, I want to be an upstander and I want my kids to be upstanders too. We should not tolerate bad behavior. Instead, we should stand up for kindness and positivity! While I do believe all of us have good in us, being an upstander isn’t a passive role so it takes some effort on our part to be one. Thankfully, it’s easy to be an upstander when you set it as an intention and thus, make small efforts each day. Here are some easy ways to guide your children to be upstanders in their daily lives. One of the easiest ways to be an upstander is to model positive behavior. I’ve written a lot about random acts of kindness because I believe small acts of kindness make a big impact on the world around us. The whole concept of random acts of kindness is living the golden rule in all areas of your life. Thinking of others before yourself, noticing them, noticing when they need help. An act as small as holding the door open for someone sends a friendly, positive message. Interland is a series of games found on the Be Internet Awesome site that help kids practice kindness skills. In Kind Kingdom, it’s cool to be kind. Players progress through the levels by identifying sad citizens and giving them good vibes and by protecting citizens from bullies in the game who are spreading bad vibes. It’s super visual so it’s easy for kids to identify who is sad, happy, or being mean. And the icons for the good vibes are meaningful symbols like hearts and a flexed bicep to show how helping others makes them feel loved and gives them strength. Play Interland with your kids and put your kindness skills to the test at g.co/KindKingdom. Other games on Interland are: Reality River (Don’t Fall for Fake), Mindful Mountain (Share with Care), and Tower of Treasure (Secure Your Secret). Often, we fail to take action because we don’t have time to figure out WHAT to do. Have conversations with your family about how to be Upstanders and promote positivity at home, school, and online. Talk in specifics to your child about situations they might witness or find themselves in and how to act in those situations. Counteract the insult by complimenting the victim’s appearance (either publicly or in private). In situations of ongoing negative behavior, encourage your child to report it. If your child is worried about being tattletale, point out that it’s not tattling if it protects someone from being hurt. And also point out that it’s the person who is behaving badly that should be worried about what people think. Kids are all different and it’s important to help each of your children find strategies that work for their individual personalities. Each of my five kids would handle an identical scenario differently. I have a very shy son who would never be able to stand up to a bully and call out the behavior in front of others. He’s also very nervous around adults and would have a difficult time reporting an incident. Though I still encourage him to consider those options, I also let him know that his strength is in comforting others and encourage him to be an upstander in that way. It comes very naturally to him to try to cheer someone up when they are feeling down. My youngest daughter is super social and is well-liked among her classmates. She does not like confrontation at all. I’ve emphasized with her how important it is for her to not take part in laughing at others because this simple act speaks volumes without her having to say a word. My older daughter uses humor. When someone is being unkind, she’ll call them out in a sarcastic way to help him or her save face by pretending they weren’t being mean on purpose. Or, she’ll do something silly or make fun of herself to draw attention away from someone else. 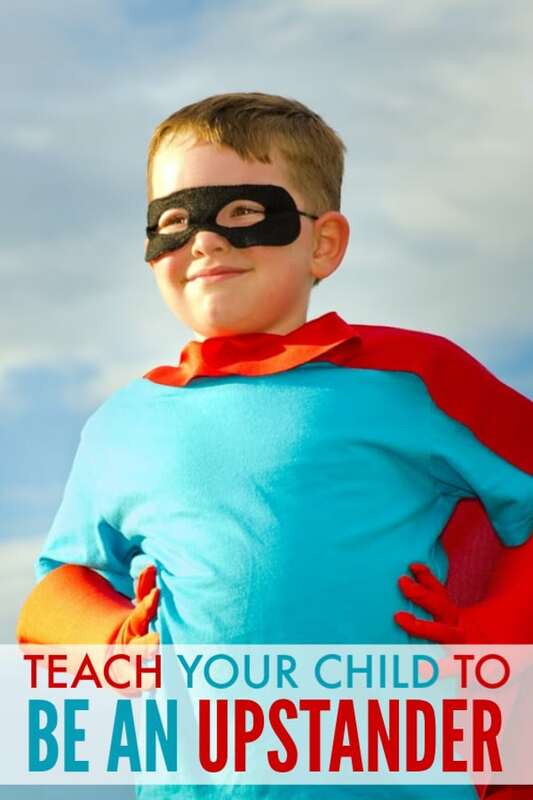 Help your child find their own upstander strengths. There are lots of ways to counteract bullying! Cyberbullying extends outside of schools, but the reality is that schools are where our kids meet and interact with their peers. It’s where they face the sneers and snickers that result from mean comments posted on social media. As a parent, I am heartbroken over the burden we place on schools and the people who work there. They must not only educate our children, but they also take on many parenting responsibilities of our children as they endeavor to safeguard students’ physical, mental, and emotional health. The sad reality is that our kids do spend a large number of their waking hours at school. So, when it comes to the character lessons we want them to learn, what happens at school plays a major role. Be Internet Awesome has designed an amazing Digital Safety and Citizenship Curriculum specifically for use in schools. You can download a copy on the Be Internet Awesome website. The curriculum covers everything from protecting kids’ online privacy to how to report dangerous behavior. I firmly believe that if we teach our children to be upstanders, we can change the trend toward violence and anger that we’ve experienced in our society. The change doesn’t have to be difficult, it just requires a small effort on our parts to be conscious of what’s happening around us and how we react to it. It is really important to raise kids with the right behavior. Thanks, Corinne for sharing your great insights here. I love this post so much….so much truth. It really doesn’t take a lot of effort to change our world for the better. This game is a great way to get a conversation going with my kids!